When developing the third generation of Pentruder concrete cutting machines, Tractive wasn’t interested in compromises. 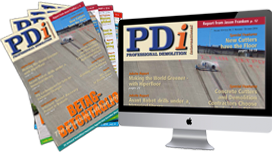 During the autumn of 2018 PDi published a long report on Volvo’s most recent demolition excavator. Caterpillar will at bauma 2019 launch a new ultra-high demolition excavator, the 340 SB, the next generation of demolition excavators from Caterpillar. After two years of intensive research and development, Hycon is set to introduce its new HRD 30 rock drill solution to bauma 2019 visitors. The new WDS 530 is a global first and is a finalist in the bauma Innovation Award competition. AUSA is launching a new dumper which can be driven backwards as well as forwards. Allu will be proudly exhibiting and demonstrating equipment from its Transformer, Processor and other equipment ranges at bauma 2019. Atlas Copco has launched the fifth generation of its flagship QAS generators range.